My heart echoes the cry of the psalmist. How do I get close to God? How do I develop a deep and abiding relationship? Can I move-in with God? What must I do so I can dwell with God? And my heart clenches tight as my mind works out a way I could meet these standards. Blameless…well maybe if God grades on a curve…I'll make it. Righteous…I am right most of the time…Check. Speaks truth…I'm not a liar. I mean when it really counts I'm honest…Got that one too. God's so lucky to have me. Is there no other way? Must I wrestle with either being self-righteous and far from God or give-up trying to be holy at all because I know I fail and also remain estranged from God? There is another way. It is accepting Jesus' holiness as our own by admitting we cannot live up to God's perfect law. Then believing that Jesus died on the cross to pay the penalty for our sin and rose again to show His sacrifice was accepted. Finally we must confess that Jesus is now in charge of our lives. Once we realize the amazing gift of forgiveness that God gave us through Jesus then not only do we long to be close to God, but we long to live holy lives in gratitude for all He has done for us. Self-righteousness melts away because only Jesus can save us. Hopelessness vanishes because God gives us power to live holy righteous lives. Have you accepted the free gift Jesus has offered you? If not pray: God I know I cannot live up to Your perfect law. I believe Jesus died on the cross to pay the penalty for the laws I have broken and rose again. I now want Jesus to be in charge of my life and I want to live for Him always. Amen. Are you using God's power to say no to unholy behavior and yes to godliness? Ask God to show you areas in your life you have unholy behavior. Ask God to forgive you and for the power to say no to unholiness. Now walk in the holiness of God with the help of His Spirit. 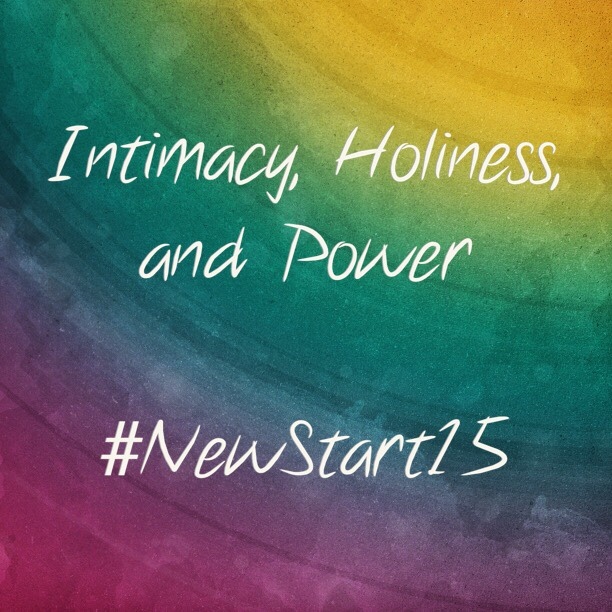 Continue your New Start 15 by visiting Kathy Howard’s blog tomorrow. Angela, thank you for this post today! So clear! What a beautiful and on-target expression of God’s truth about the “why” and “how” of holiness! Thank you Kathy! Praying for us all as we reset. Love this Angela. You ask questions we’re all asking and then you help us to see how God has answers we can cling to and live by! Your blog has spoken to my heart this morning. I do love the Lord, I want more intimacy with Him. He has shown me that I’ve got to give up the hardness I have with my family. I can be kind most all the time but have such a critical eye & tongue at home. Father help me today to turn that over to you, help me to love my family more, help me to be joyful and through You, I know that’s possible because with God ALL things are possible! I’m so glad God used my words and His to encourage you today. I pray we all seek to live holy lives. Loved reading and sharing your blog this morning. Thank you for the challenge, inspiration, and realness. Blessings to you! This is so perfect. Simple, simple, simple. A friend once commented, he thought we angered Jesus by making Christianity so complicated for ourselves and others. Wonderful post. Pingback: How's that New Start working out?